In Plain Sight… The Pen Mic! On my last show, I was having some problems with body mics and scratchy police officer wardrobe. After trying different ways to mic up the cast with hidden techniques that were not 100%, I though I’d venture into the realm of the pen mic. Now, I’m not the first person to use the idea… it’s just my first foray and I thought I’d share my results. With the right pen, the process is very quick! Black Pen Color to match Sanken. 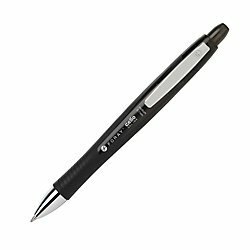 While shopping, I found the Foray Gelio Super Comfort Grip (Retractable Gel Pen, 0.7 Mm, Medium Point, Black Barrel, Black Ink) and thought it looked like a good candidate. First I unscrewed the tip and then removed the ink & stylus. Then, using a pliers, I crushed the plunger allowing it’s removal without damaging the outer tube of the pen. The plunger, ink stylus and tip can go into the bin. I then did a test with a COS-11 to see if it would fit up through the tube… Sure enough, it fit! Then for the windscreen test… it fit with almost no space to spare. Perfect! Now to button things up and secure the mic on both sides of the pen, I took some small pieces of Joe’s Sticky Stuff (aka Snot Tape) and stuffed some evenly around the head of the mic (while the windscreen is off) while trying to keep the head centered. I used a Tweeker tool to careful push the Joe’s and mic head into place. I then reapplied the windscreen and pushed it into what looked like a decent position. Finally I put a plug of Joe’s into the bottom of the pen to hold the cable in place. Joe’s Sticky Stuff is removable. If you were looking for a more permanent installation, I think Sugru would be a great choice! Who to use it on? This mic is great for cast with pockets on the shirt. Cops, scientists, etc… You will need to get together with the wardrobe department to have them cut a hole behind the pocket for routing of the wire to the pack. Here is the result! Enjoy!